My friend and blog-follower Irene asked me to do two posts- one on fireplace mantel displays and one on coffee table displays. Considering my coffee table is currently a mess of magazines, discarded jewelry and empty bottles of water- I’ll start with fireplaces. 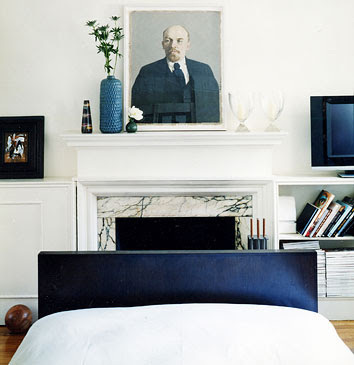 There’s no real formula to getting mantle decoration right, other than these simple rules: you do NOT need to have the sides be symmetrical (i.e. 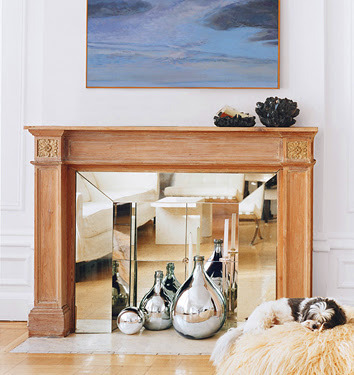 it looks best to have items that are taller on one side of the mantle, despite natural inclination to mirror the items) and to keep smaller items in groupings. I am still working on my mantlescape, and these photos help inspire me! If you have a collection of something, this is a great place to use it! 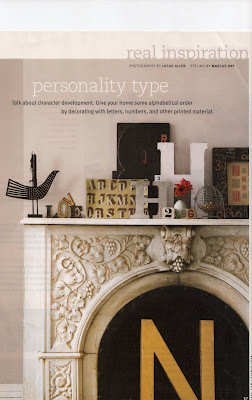 I love this grouping of letter themed objects and art! Here is a great example of a nice lack of symmetry: tall items on the left, pairing of similar items on the right. Most people would put one glass vase on each side but this looks far more interesting! This was an old photo I had in my files that I found so cool. 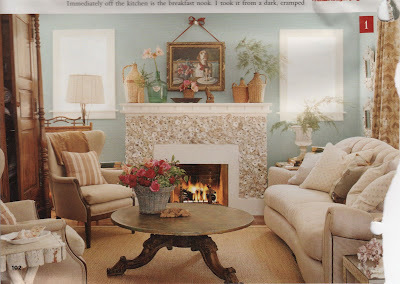 The woman who owns this house decoupaged her actual fireplace with oyster shells! 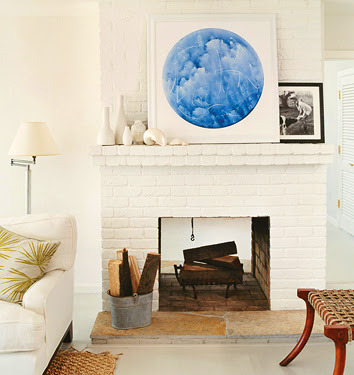 Another area to get creative with if you find that part of your fireplace boring. I love this room. LOVE. Most of the items are symmetrical-the bookcases,chairs, etc., but again, the mantle is not and there we are again with the grouping of similarly colored objects to one side. 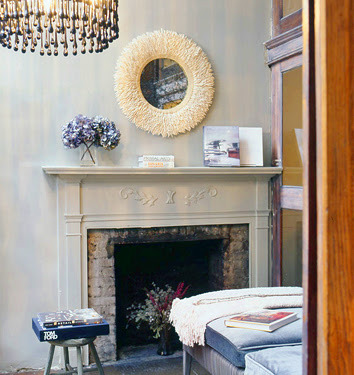 I am actually trying to help a client figure out what to do with the dead space in her non-working dining room fireplace and the next two ideas are bold, but fun! I love the mirrors with the mercury vases in front. It creates a great illusion of depth. If you have a wallpaper that might be too bold for a whole wall, this is a great use for it! 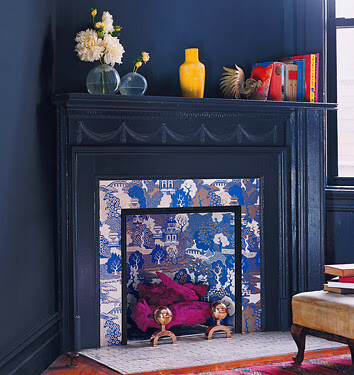 I am also loving the all black walls and mantle. A very brave choice, but how chic! And notice the logs they painted magenta! Crafty, crafty. This is such a fantastic photo! 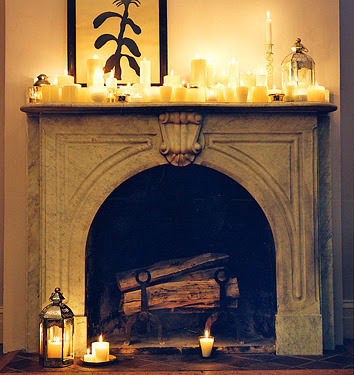 The clutter of lit candles gives such a wonderfully warm and enchanting feeling to the fireplace- without lighting a fire! You can use flameless pillar candles candles, like the one’s my friend Kate bought at Smith and Hawken, in various sizes to avoid finger burns and wall soot. They look real and just as good! A simple, but very pretty mantle. Thank you!! I have some inspiration now and I myself am always so symmetrical. I think I will try and break away from that rut! Thanks again!!! Love the shell fireplace…saw that in domino or something. That would be cool! I need some help with my fireplace mantel. I don’t know if I could send you a picture and tell me what you think.